RICHMOND, Va. -- The Stormtracker 8 weather team has always had the brains behind Richmond's Most Accurate Forecast, but they now have the technology, too. We hope you've noticed our new Stormtracker 8 weather system scanning the skies over your home for weather better and faster than ever before. It's all thanks to 'VIPIR' technology. When it comes to life-threatening weather, seconds matter. 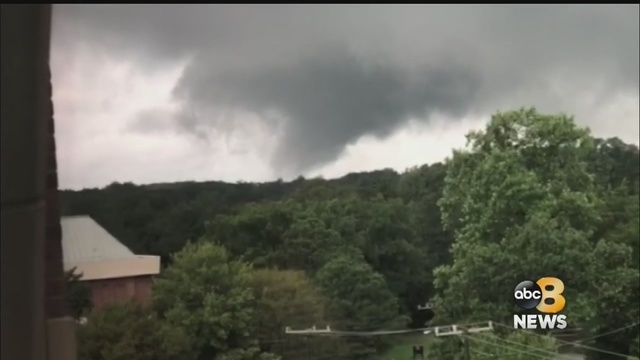 "The (new weather) system sees every piece of information from the radar that the National Weather Service puts out, and it does it in 90 seconds," Stormtracker 8 Meteorologist Matt DiNardo explained. "That's compared to five minutes, which was the transmission time with the old weather systems." VIPIR real-time radar is watching the skies over our region with the power of four radar sites; it's a whole new look at whatever kind of weather moves into RVA. "The old radar would scan across it and we would see what we could see going on," DiNardo said. "Dual-pol (polarization) scans across, and then vertically as well. Two ways to see data." The National Weather Service's upgrade from standard WSR 88-D Radar to Dual-Polarization Radar was developed by Baron Weather Company -- the same company now providing our VIPIR real-time radar. This new way of scanning the atmosphere lets us know exactly what kind of precipitation is falling from the sky, based on the type of return that the radar receives--not a "best guess" of what kind of precipitation is falling based on the temperature, like the regular WSR 88-D radar. This new Dual-pol technology is a game changer, and what sets the Stormtracker 8 team apart from the competition. Remember last September, when the remnants of Hurricane Florence spun off tornadoes here in RVA? We saved the radar data from that day and fed it into the VIPIR real-time radar system and the difference was clear: You can see a cone, marking the funnel cloud, giving our meteorologists and you the viewer a real-time look at where dangerous weather is. "Greater accuracy in terms of tracking, when will this hit my town, street, neighborhood," DiNardo added. "We could show your driveway, your house, mailbox. That's how tight we can get with the data underneath it." And that means giving you more warning and more time to get somewhere safe. "Minutes save lives, it gives you the time to get your family together, get into the interior room or your basement. Protect your precious loved ones," DiNardo continued. Stormtracker 8 meteorologists will also be able to pick apart a storm like never before. They will be able to climb right inside funnel clouds looking for signs that it's getting stronger or weakening, and see where it's doing damage on the ground. "It's scanning every elevation as the winds are coming in," DiNardo added. "No one else can do that."